Casbah of Algiers a UNESCO world heritage site. Algeria is the largest country on the African continent and the 10th largest country in terms of total area. Located in North Africa, one of the main tourist attractions is the Sahara, the second largest desert in the world. Some sand dunes can reach 180 meters in height. Algeria has been a member of the World Tourism Organization since 1976. 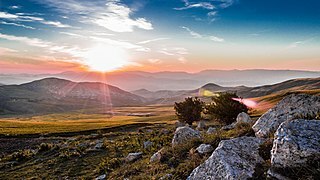 According to a report of the World Tourism Organization published in 2014, Algeria is the 4th largest tourist destination in Africa in 2013 with 2,7 million foreign tourists, and ranks 111th on the international tourism scene, according to the London-based World Tourism and Travel Council (WTTC). The tourism sector in Algeria accounts for 3.9% of the volume of exports, 9.5% of the productive investment rate and 8.1% of the Gross Domestic Product. The main competitors are other Mediterranean countries, the majority of which have developed a strong tourism-based economy. The tourism sector is still underdeveloped in Algeria concerning accommodation and other services. For this reason, the government launched a strategic plan to boost this sector by 2025. 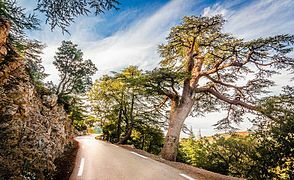 According to Gallup's Law and Order Index, which measures personal safety as well as personal experiences of crime and law enforcement, Algeria ranked 7th in the world's safest countries for 2017. According to the U.S. News & World Report Algeria is ranked among the top 80 countries in the world in 2018. In its Best Countries Ranking published each year, the weekly draws up a ranking based on several criteria such as business, citizenship, cultural influence, heritage, quality of life or the possibility of adventures. The US national newspaper USA Today, has ranked Constantine among the eleven cities to visit the world in 2018. The newspaper was based on the experience of Sal Lavallo, one of the youngest people to have visited all 193 member states of the United Nations. A project developed during the "National and International Conference of Tourism" was born providing a new dynamics of reception and management of tourism in Algeria. This project is called (Horizon 2025). Foreign investors, mainly French, position themselves to dominate the market, focused mainly on a business clientele. A first advertising campaign devoted to the industry was carried out to attract investors as well as foreign customers, as well as concrete measures such as conferences, trade shows or commissions. The international footballer Zinedine Zidane of Algerian descent was also used for a new commercial carried out this time under the aegis of the telephony operator, Ooredoo Algeria, intended for an individual clientele. A Quality Tourism Plan Algeria was adopted by the government but by the end of 2010, only 10% of tourist structures in Algeria have joined this program. Investors remain interested in the potential of the country, as well as the high authorities, as the representative of the Secretary-General of the World Tourism Organization (WTO), Frédéric Perret, told the conference of the International Tourism and Travel Exhibition held In Algeria in 2010, that the Algerian tourism sector has great potential thanks to its "Mediterranean beaches, its fascinating Djurdjura National Park, its human, cultural and historical treasures." As part of the tourism development policy, 'Eductour' is regularly organized for the national and international. Beni Hammad Fort also called Al Qal'a of Beni Hammad (in Arabic :قلعة بني حماد) is a fortified palatine city in Algeria. Now in ruins, in the 11th century, it served as the first capital of the Hammadid dynasty. 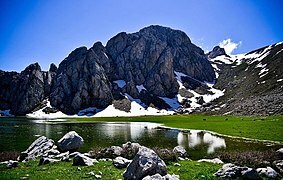 It is in the Hodna Mountains northeast of M'Sila, at an elevation of 1,418 metres (4,652 ft), and receives abundant water from the surrounding mountains. 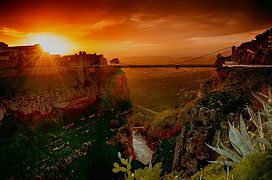 Beni Hammad Fort is near the town of Maadid (aka Maadhid), about 225 kilometres (140 mi) southeast of Algiers, in the Maghreb. In 1980, it was inscribed as a World Heritage Site by UNESCO, and described as "an authentic picture of a fortified Muslim city". The town includes a 7-kilometre (4 mi) long line of walls. Inside the walls are four residential complexes, and the largest mosque built in Algeria after that of Mansurah. It is similar in design to the Grand Mosque of Kairouan, with a tall minaret, 20 metres (66 ft). Excavations have brought to light numerous terracotta, jewels, coins and ceramics testifying to the high level of civilization under the Hammadid dynasty. Also among the artifacts discovered are several decorative fountains using the lion as a motif. The remains of the emir's palace, known as Dal al-Bahr, include three separate residences separated by gardens and pavilions. Djémila (in Arabic :جميلة, the Beautiful one, Latin: Cuicul or Curculum), formerly Cuicul, is a small mountain village in Algeria, near the northern coast east of Algiers, where some of the best preserved Berbero-Roman ruins in North Africa are found. 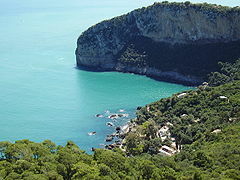 It is situated in the region bordering the Constantinois and Petite Kabylie (Basse Kabylie). Casbah of Algiers, (in Arabic :قصبة الجزائر}, qaṣba, meaning citadel (fortress)) is specifically the citadel of Algiers in Algeria and the traditional quarter clustered around it. More generally, a kasbah is the walled citadel of many North African cities and towns. The name made its way into English from French in the late 19th century (the Oxford English Dictionary states 1895), and often is spelled "kasbah," but also "casbah." M'Zab Valley, or Mzab, (Mozabite Aghlan, is a natural region of the northern Sahara Desert in Ghardaïa Province, Algeria. 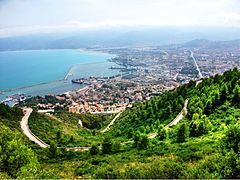 It is located 600 km (370 mi) south of Algiers and there are approximately 360,000 inhabitants (2005 estimate). Timgad, (called Thamugas or Thamugadi in old Berber) was a Roman-Berber town in the Aurès Mountains of Algeria. It was founded by the Emperor Trajan around AD 100. The full name of the town was Colonia Marciana Ulpia Traiana Thamugadi. Trajan commemorated the city after his mother Marcia, eldest sister Ulpia Marciana, and father Marcus Ulpius Traianus. Located in modern-day Algeria, about 35 km east of the town of Batna, the ruins are noteworthy for representing one of the best extant examples of the grid plan as used in Roman city planning. In the former name of Timgad, Marciana Traiana Thamugadi, the first part - Marciana Traiana - is Roman and refers to the name of its founder, Emperor Trajan and his sister Marciana. The second part of the name - Thamugadi - "has nothing Latin about it". Thamugadi is the Berber name of the place where the city was built, to read Timgad plural form of Tamgut, meaning "peak", "summit". Sometimes Tipasa is called "Tipasa in Mauretania", because there was another Tipasa in Roman Africa. Indeed, another town called Tipasa was located in the Roman province of Numidia (the reason why it is referred to as "Tipasa in Numidia", is in order to distinguish it from "Tipasa in Mauretania"). This second Tipasa is located in what is now Constantine Province, Algeria, 88 km (55 mi) due south of Annaba, 957 m above the sea: it is now called Tifesh. The chief ruin is that of an extensive fortress, the walls of which are 3 metres thick. 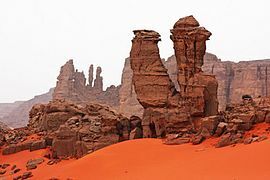 Tassili n'Ajjer, is a heavily eroded sandstone rock formation in the Algerian section of the Sahara Desert, situated on a vast plateau, that encompasses south-east Algeria, western Libya and northern Niger. It features over 300 rock arches, dense clusters of eroded sandstone rock pillars and steep cliffs and gorges where water pools permanently at the surface. Tassili n'Ajjer covers an area of over 72,000 km2 (28,000 sq mi). Religion in Algeria is dominated by Muslims at about ninety-nine percent of the population. The vast majority of Muslims in Algeria adhere to Sunni Islam of Maliki school of jurisprudence. There are also almost 100,000 Christians, mostly Pentecostal Protestants. There are nearly 2,000 Jews still living in Algeria, according to the US department of State. Djamaâ El Djazaïr (Mosque of Algeria, in Arabic : جامع الجزائر); or Great Mosque of Algeria (in Arabic : مسجد الجزائر الأعظم) Is a mosque in the process of completion, located in Mohammedia in Algiers. Is the largest mosque in Algeria and Africa and the third largest mosque in the world in terms of the total area after each of Great Mosque of Mecca in Mecca and Al-Masjid an-Nabawi Mosque in Medina. Ketchaoua Mosque is a mosque in Algiers, the capital of Algeria. It is located at the foot of the Casbah, which was built during the Ottoman rule in the 17th century, which is a UNESCO World Heritage Site. The mosque that stands on the first of the Casbah's many steep stairways, was logistically and symbolically the cynosure of the pre-colonial city of Algiers. The mosque is noted for its unique fusion of Moorish and Byzantine architecture. 1st November of 1954 Great Mosque is considered to be the largest mosque in Algeria and the second in Africa It is located in the town of Batna. This imposing religious building has been open to the faithful since 2003 and is one of the great architectural achievements of the city. The Basilique Saint Augustin (Basilica of St Augustine) is a Roman Catholic basilica and Pro-cathedral dedicated to Saint Augustine of Hippo located in Annaba, Algeria. The basilica is under the circumscription of the Diocese of Constantine. Construction of the basilica began in 1881 and finished on March 29, 1900, though the church was not dedicated until April 24, 1914. The statue of St. Augustine in the basilica contains one of his arm bones. It was built not far from the remains of the Basilica Pacis built by Saint Augustine, where he died while the city was besieged by Vandals. Cathédrale du Sacré-Cœur d'Oran is a Roman Catholic church located on the Place de la Kahina, on Boulevard Hammou-boutlelis, in Oran. Djama'a al-Djedid, also referred to as the Jamaa al-Jadid, Jamaa El Jedid, or the New Mosque, (Turkish: Yeni Camii, meaning New Mosque) is an Ottoman mosque located in Algiers, the capital of Algeria. It was built in 1660 in accordance with the traditions of the Hanafi school. During the French colonial rule, the mosque was called the Mosquée de la Pêcherie and in English the Mosque of the Fisherman's Wharf. Great Mosque of Tlemcen was first built in Tlemcen, Algeria in 1082. It is one of the best preserved examples of Almoravid architecture. It was built under sultan Yusuf ibn Tashfin, but substantially reconstructed and enlarged by his son Ali ibn Yusuf. An inscription dates this reconstruction to 1136. Sultan Yaghmoracen (1236-1283), the founder of the Abdalwadid dynasty of Tlemcen added a section with a minaret and a dome in the 13th century. Next to the mosque there used to be an Islamic court (Makhama) and an Islamic university of considerable fame. Abdallah Ibn Salam Mosque is a mosque in Algeria. Formerly the Great Synagogue of Oran (in Arabic :معبد وهران العظيم), it was built in 1880 at the initiative of Simon Kanoui, but its inauguration took place only in 1918. Also known as Temple Israelite, it is located on the former Boulevard Joffre, currently Boulevard Maata Mohamed El Habib. It was one of the largest synagogues in North Africa. Algerian Jews relocating to France in the 1960s were assigned "repatriate" status and classed alongside the European settler population owing to the fact that the Jews of Algeria had been French citizens since the Crémieux Decree of 1870. The Abdallah Ibn Salam mosque is named after a 7th-century Jew from Medina who converted to Islam. Botanical Garden Hamma is a 58-hectare (140-acre) botanical garden (38 hectares (94 acres) of gardens and 20 hectares (49 acres) of arboretum) located in the Mohamed Belouizdad (formerly Hamma-Anassers) district of Algiers. It was established in 1832.. Hiking enthusiasts have access to the vast mountains of Kabylia. 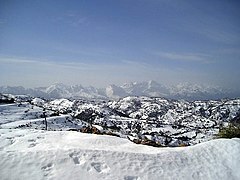 Despite what is thought, Algeria also has a ski area in Tikjda as well as spas. Architecturally, there are strong Berber, Arabic, Spanish and French influences following colonization, but also more contemporary works. The main post office in Algiers remains a monument of the neo-Moorish type, the work of Jules Voinot and Marius Toudoire. The Casbah of Algiers is also a place of visit classified as a world heritage of UNESCO since 1982. The Algerian Desert is located in north-central Africa and is part of the Sahara Desert. The desert occupies more than four-fifths of the Algerian territory. 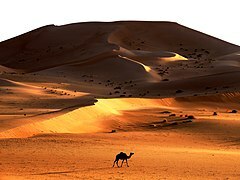 Its expansion starts from the Saharan Atlas, more or less as a stony desert and the farther inland you get the more of a sand dune desert it becomes. 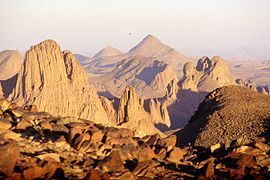 In the southwestern parts is the mountain range Tassili n'Ajjer located. This area is a subject of great archaeological interest and was put up on the "World Heritage List" by UNESCO in 1982. The area is known for extreme aridity and extreme heat, as daytime temperatures are commonly between 46 °C (113 °F) and 51 °C (122 °F) during the hottest period of the year in most of the desert. 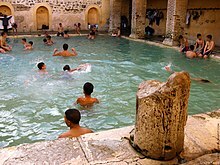 The rectangular pool of the Hammam Essalihine in Khenchela. The cuisine of Algeria is a distinct fusion of Andalusian, Berber, Mediterranean. It's differs slightly from region to region. 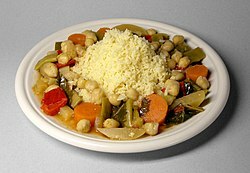 Every region has its own cuisine, including Kabylie, Algiers (couscous) and Constantine. Algerian Cuisine is influenced by various cultures such as Berber, Arabic and French. Most of the Algerian dishes are centered around lamb or beef, olive oil, fresh vegetables and fresh herbs. Traditionally, no Algerian meal is complete without bread, normally a long French baguette or more traditionally a flat semolina bread. Pork consumption is forbidden to devout Muslim inhabitants of Algeria in accordance with Sharia, religious laws of Islam. Algeria, like other Maghreb countries, produces a large range of Mediterranean fruits and vegetables and even some tropical ones. Lamb is commonly consumed. Mediterranean seafood and fish are also eaten and produced by the little inshore fishing. Algerians consume a high amount of meat, as it is found in almost every dish. Mutton is the most eaten meat in the country, Poultry and beef are also used, other uncommon types of meat such as game, birds and venison and they are considered a delicacy, wild boar is also hunted and eaten, but pork will not be available on stores, it can only be bought from hunters directly. Vegetables that are commonly used include potatoes (batata/betetè), carrots (zrodiya), onions (bsel), tomatoes (tomatish/tømètish), zucchini (corget/qar'a), garlic (ethom), cabbages (cromb), and eggplant (badenjan). Olives (zéton) are also used. Vegetables are often used in stews (jwaz/djwizza) and soups (chorba) or simply fried or boiled. The Kesra, traditional Algerian flatbread, is the base of Algerian cuisine and eaten at many meals. A popular Algerian meal is merguez, an originally Berber sausage. A common and one of the most favorite dishes of Algerian cuisine is couscous, with other favorites such as shakshouka, Karantita, marqa bel a'assel, a speciality from Tlemcen, and the dish chakhchoukha. Spices used in Algerian cuisine are dried red chillies of different kinds, caraway, Arabian ras el hanout, black pepper and cumin, among others. Algerians also use tagines, handmade in Algeria. Frequently Algerian food is cooked in clay vessels, much like Maghrib cuisine. Algerian cuisine represents the region north of the Sahara desert and west of the Nile. Algerian chefs take a lot of pride in cooking skills and methods and their many secrets lie in the variety of ways they mix special spices. There are many different types of Algerian salads, influenced by the French and Turkish, which may include beetroot or anchovies. There are also dishes of Spanish origin in Algeria, like the Gaspacho Oranais, an Algerian version of a Manchego dish. 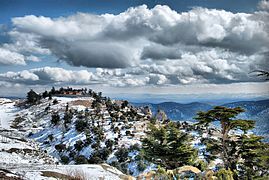 Northern Algeria is in the temperate zone and enjoys a mild, Mediterranean climate. It lies within approximately the same latitudes as southern California and has somewhat similar climatic conditions. Its broken topography, however, provides sharp local contrasts in both prevailing temperatures and incidence of rainfall. Year-to-year variations in climatic conditions are also common. This area, the most inhabited in Algeria, is commonly referred to as the Tell. As the tenth-largest country in the world, and the largest in Africa and in the Mediterranean region, Algeria has a vast transportation system which include many transportation infrastructures. ^ Bellini, Nicola; Pasquinelli, Cecilia (2016-08-29). Tourism in the City: Towards an Integrative Agenda on Urban Tourism. Springer. ISBN 9783319268774. ^ Arabic Name Translator. "The Casbah (Arabic: قصبة, qaṣba, meaning citadel (fortress)) is specifically the citadel of Algiers in Algeria and the traditional quarter clustered around it. More generally, a kasbah is the walled citadel of many North African cities and towns." ^ Tanya Reinhart Israel/Palestine: How to End the War of 1948 2011- Page 151 "The Jenin refugee camp and the Casbah in Nablus were considered by the Israeli army to be the toughest areas to conquer. Preparations to seize these areas began long in advance. In January 2002, Amir Oren reported in Ha'aretz that the ..."
^ Haddadou, Mohand Akli (2012). Dictionnaire toponymique et historique de l'Algérie: comportant les principales localités, ainsi qu'un glossaire des mots arabes et berbères entrant dans la composition des noms de lieux (in French). Tizi Ouzou: Achab. p. 529. ISBN 9789947972250. ^ a b Gascou, Jacques. "La politique municipale de l'empire romain en Afrique proconsulaire de Trajan à Septime-Sévère". Publications de l'École française de Rome. 8 (1): 97–100. ^ "Tassili-n-Ajjer". britannica. Retrieved February 7, 2017. ^ "Africa :: ALGERIA". CIA The World Factbook. ^ "Kasbah of Algiers". Unesco. Retrieved 2010-11-12. ^ "Algiers Kasbah: 1992Evaluation" (pdf). Unesco. Retrieved 2010-11-14. ^ McDougall, James (2006). History and the culture of nationalism in Algeria. Cambridge University Press. pp. 217–220. ISBN 0-521-84373-1. Retrieved 2010-11-14. ^ "Visit the Historic Ketchaoua Mosque in Algiers". Algeria.com. Retrieved 2010-11-12. ^ Delorme, Christian (2008). L'émir Abd-el-Kader à Lyon: 12-13 décembre 1852. Lyon: M. Chomarat. p. 59. ISBN 9782908185676. ^ "Algiers Viewed from Outside Notre Dame d'Afrique". World Digital Library. 1899. Retrieved 2013-09-25. ^ Auzias, Jean-Paul Labourdette, Dominique (27 October 2010). Algérie. Petit Futé. p. 264. ISBN 978-2-7469-2575-5. Retrieved 20 May 2012. ^ "Tassili n'Ajjer - UNESCO World Heritage Centre". Whc.unesco.org. Retrieved 2013-03-18. ^ a b "Luce Ben Aben, Moorish Women Preparing Couscous, Algiers, Algeria". World Digital Library. 1899. Retrieved 2013-09-26. ^ "Food in Algeria". Food in Every Country (website). Accessed May 2010. ^ French words: Past, Present, and Future. M.H. Offerd. 2001. Page 89. ^ Research in African Literatures. Volume 34. 2003. Page 34. ^ Merquez and Qadid, North-African preserved meats.http://www.cliffordawright.com/caw/food/entries/display.php/topic_id/20/id/41/. ^ "Gaspacho oranais ou manchego". Coundris.chez-alice.fr. Retrieved 2014-08-27. ^ "Algeria - Climate and Hydrology". countrystudies.us. U.S. Library of Congress. Retrieved 18 February 2018. This article incorporates text from this source, which is in the public domain. Wikivoyage has a travel guide for Algeria.